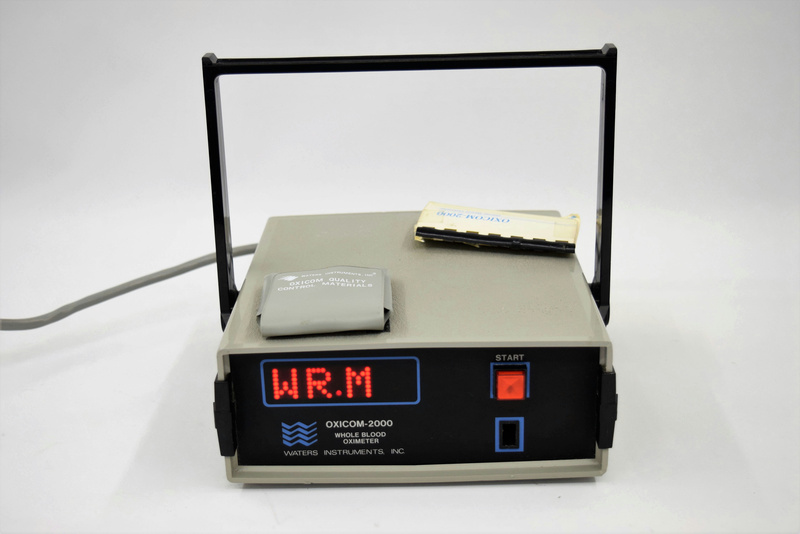 Waters Instruments Oxicom-2000 Whole Blood Oximeter . New Life Scientific, Inc.
amount of oxyhemoglobin and total hemoglobin, the ratio of the intensity of the light reaching the Red cell to that reaching the IR cell is a function of the oxygen saturation of the blood sample. The light intensity produces a proportional change in photodetector output voltage. This voltage is measured by the on-board computer. During use, the on board computer compensates for non-specific changes. This is accomplished by measuring the light emitted with no blood in the housing. It then measures the light absorbed by the sample. Given these values, it uses them to calculate O2%. New Life Scientific technicians tested this product and it appears to be functioning. It will come with three standards. This product has minor cosmetic blemishes that do not hinder its functionality. working products in the interest of maximum customer satisfaction. Tested, minor cosmetic flaw as mentioned in Testing, but in excellent operating condition.